﻿ General-purpose Clutches | Product Information | F.C.C. Co.,Ltd. 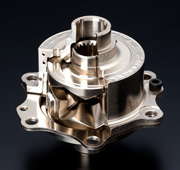 Originally developed for four-wheel ATVs, the limited slip differentials from F.C.C. achieve the smooth cornering and stable driving that ATVs demand. These cam-type torque-sensitive differentials distribute optimal drive force to the right and left wheels when cornering or in response to road surface conditions. They can be counted on for stable steering and superior running on rough surfaces. Developed for compact snow throwers and lawn mowers, this system features smooth transition between output speeds, achieved by altering the volume of oil flow between the hydraulic pump and hydraulic motor. 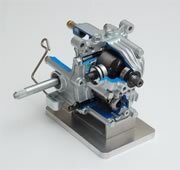 This lightweight, compact transmission made with light materials such as aluminum can be put to good use with 4- to 7-PS engines.